As the capital of Greece, Athens is the nation's most important city and has been attracting travellers for countless centuries. While it may not be as popular as many other European capitals, it has seen a steady rise in the number of visitors over the past few years, particularly after the Athens Olympic Games of 2004 - the first time Olympic Games in Athens since 1896. With a population of nearly 4 million, Athens is the largest city in Greece. Unfortunately, it has also become one of the most polluted cities in the continent as well. Athens is one of the longest inhabited cities, dating back 3,000 years or more. During the glory years of Ancient Greece, it was one of the most important city states in the world. Today, historical monuments such as the Parthenon on the Acropolis, the Temple of Olympian Zeus, the Temple of Hephaesus and the Agora are the landmark attractions which continue to draw visitors from across the globe. Omonoia with Omonoia Square, the oldest square in Athens. Omonoia is the most ethnically diverse neighbourhood in Athens with many middle Eastern popoulations residing and working there. Metaxourgeio is a neighbourhood is located south of the historical centre of Athens, between Kolonos to the east and Kerameikos to the west, and north of Gazi. Psiri and Gazi are dotted with renovated former mansions, artists' spaces, and small gallery areas. Lately, these areas were transformed to major nightlife destinations with Gazi taking the lead in clubbing while Psiri kept a more traditional style with places to drink wine , ouzo etc. 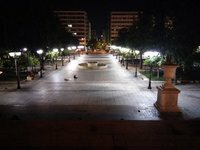 Syntagma - with Syntagma Square, the capital's central and largest square, lying adjacent to the Greek Parliament (the former Royal Palace) and the city's most noted hotels. Ermou Street, an approximately one kilometer-long pedestrian road connecting Syntagma Square to Monastiraki, has traditionally been a consumer paradise for both Athenians and tourists. Plaka is one of the most traditional neighbourhoods in Athens. Adrianiou and Kidathinaion streets are teeming with tourist shops for souvenirs and restaurants usually having a live greek music programm. Monastiraki Monastiraki is one of the most beloved tourist destinations within the city. It has many restaurants to taste the traditional greek souvlaki and other places to dine or drink while also famous are the many bars and coffee shops located on top of the area's buildings which have a very good view of Acropolis. Kifisia and Nea Erythraia These two adjacent neighbourhoods are not in the center of Athens. They are located approximately 15 kilometres north of the historical center but have their own visit value. Being relatively new neighbourhoods they have no historical sights but they have a very vivid nightlife. They are two of the most expensive neighbourhoods in the Athens urban area so expect to find nice cars in the streets, very nice luxurious and somewhat expensive bars with unique style and in general the style that fits to moneyed residents. Highly recommended for travellers that have been in Athens before and want to experience something new. Originally built in the 5th century BC the Parthenon (Παρθενών) is the most famous ruin in all of Greece and is located on the Acropolis. This building was built as a temple to Athena in Athens. This building also represents an enduring symbol of Athenian democracy. It has many excellent examples of ancient Greek architecture and art work on the inside. The temple has had many forms in the different eras of occupation ranging from a temple to Athena, to a christian church to a mosque. Today it is one of the most popular tourist sights in all of Greece. 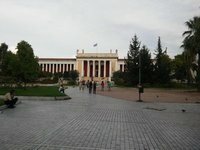 The Academy of Athens, the National Libarary of Greece and The University of Athens are the 3 neoclassical buildings that make the so called Trilogy of Athens. Build by brothers Theophil and Christian Hansen these buildings are an absolute must for the lovers of architecture. One of the best museums about the ancient greek civilization in the whole world, the National Archeological Museum houses true treasures about all the eras of Greek history as well as many exhibits from ancient Egypt. Arguably the best museum in Athens, visit it no matter what and be prepared to spend a decent amount of time in it. The Athens and Epidaurus Festival (Also Known as The Hellenic Festival) - This is the oldest and most famous festival in Greece that is rich in history and a pure celebration of Greek art and culture. It highlights and promotes the work of young artists in various forms of contemporary, modern and classic art. For more than 40 years, a great number of artists have performed through the medium of music, theatre, dance, visual arts, ballet, acrobatics and opera, making it a top festival to see when in the city of Athens. August Moon Festival - Archaeological sites around the city are opened late into the night to the public in celebration of the full moon. You'll find the areas around the Acropolis, Thisson and Monastiraki packed with people as activities, theatrical performances and cultural events will take place. The Acropolis won't be open this year, but its Museum will open late with a free concert along the Grand Promenade. The combination of pollution and high temperatures (up to 43 °C), makes summer a bad time to visit Athens. Winters are mild with occasionally some frost at night, but usually above zero. Spring and autumn have very nice and warm conditions and nights are pleasant as well. In general, Athens is a dry and sunny city during these times with some showers possible but rarely rainy all day. Athens International Airport (ATH) is the main airport in the city and is the main hub for the national airline of Olympic Airlines. Destinations with this airline include Alexandria, Amsterdam, Berlin, Cairo, Dubai, Frankfurt, Geneva, Johannesburg, London, Montreal, Moscow, New York, Paris, Toronto and Vienna. Aegean Airlines has several flights within Europe as well, including Rome, Milan and Düsseldorf. Many European airlines have direct flights to Athens. Easyjet is a low-cost airline serving Athens from London, Berlin, Paris and Milan. Olympic Airlines has domestic flights to many destinations from Athens including Alexandroupolis, Chania, Chios, Corfu, Heraklion, Ioannina, Kalymnos, Karpathos, Kavala, Kefalonia, Kithira, Kos, Limnos, Milos, Mykonos, Mytilene (Lesbos), Naxos, Paros, Rhodes, Samos, Santorini, Sitia, Thessaloniki and Zakynthos. Aegean Airlines has a share of domestic flights as well. Car: The airport is accessible by the Attiki Odos toll highway from the centre of Athens and northern Athens, Varis-Koropiou Avenue from the western part, Laurio Avenue from the south and Spata-Loutsa Avenue from the east. Parking places and rental car companies are both widely available at the airport. Also taxis and limousines are available, albeit at a cost of course. Rail: A train station next to the airport terminal is accessible by an elevated walkway. The station is served by both the Athens Metro and Suburban rail service Proastiakos. The station is connected with line 3 of the Athens Metro, while it is also connected to the Athens Central Railway Station (Larissis Station) and the port of Pireaus as well as to Corinth via Proastiakos. Bus: Four bus lines (X93, X95, X96, X97) connect the airport directly to metropolitan Athens and the port of Piraeus. Regional bus services by KTELKTEL Express also operate to the airport, with connections from Athens Airport to Rafina, Markopoulo, Lavrio, Kalyvia, and Keratea. The Hellenic Railways Organisation operates a network of train, most of them originating and terminating in or near Athens. Trains north stop in Thessaloniki, Livadia, Paleofarsala, Larissa, Plati, Edessa, Florina, Seres, Drama, Komotini and Alexandroupolis while trains south stop in Kiato, Xylokastra, Diakofto, Patras, Olympia, Argos, Tripoli, Megalopolis and Kalamata. Be aware though that driving in Greece is not as easy as you think, Greek drivers are speeding and overtaking many times without any warnings. There are some good highways like the Corinth - Athens and the Athens - Larissa highways. In Athens itself, traffic jams occur mainly at early morning and late afternoon rush hours, but traffic is heavy throughout the day as well. KTEL operates numerous buses from Athens throughout destinations in Greece. There are dozens of ferries to and from Piraeus, the port of Athens and located within the municipality. Check the Greek Travel Pages for an impression about companies, schedules and prices, as the choice is very wide. Or check the Greek Ferries website or another one about Ferries between islands in Greece. This applies to both international and even more so domestic connections to many of the islands. Routes from Piraeus usually go to the Argo-Saronic, Cyclades, Dodacanese and the Northeast Aegean island chains and also to Crete and other mainland ports as far as Thessaloniki. On some routes, faster hydrofoil services operate. There are two classes on most ships (first and second) and couchettes are available on night trips. In summer, book well in advance. SNCM between Pireús and Genoa. Although remember that time schedules are not an exact science in Greece. Therefore many ferries leave early or more often extremely late from port. This means do not depend on time schedules ever! Always get to port a little early and be prepared to wait. Canary yellow taxis are a common sight in Athens and are a reasonably priced way of getting around (if you can avoid the traffic jams). The starting fee is €1.19, after which the meter ticks up at €0.34/km ("rate 1") or €0.64/km ("rate 2"), with a minimum fare of €3.20. Rate 1 applies through Athens city limits, including the airport, while rate 2 applies outside the city and from midnight to 5 AM. Legal surcharges apply for calling a cab by radio (€1.60), trips to or from the airport (€3.20) and heavy bags (€0.32). Tipping is not necessary, although it's common to round up to the nearest full euro. Public transport is very good and convinient in Athens. During daytime you can expect very frequent routes but chances are that you will encounter many full metro trains during rush hour. Most of the bus lines stop operating around midnight and Metro lines around 00:30am. Friday and Saturday the metro lines extend their operation until 2:30am. There are also a few bus lines tha operate 24/7. For the complete schedules you can visit the OASA webpage. To plan a route just put it on google maps and it will show you what bus/metro/tram/trolley to use. The simple €1.40 ("integrated") ticket lets you travel on any means of transport - metro, suburban trains, trams, trolleybuses, buses - with unlimited transfers anywhere within Athens (except the metro airport line east of Doukissis Plakentias and the airport buses) for 90 minutes, and you can also get a €4 ticket valid for 24 hours, a €14 weekly ticket or a 3-day "tourist" ticket for €20 that includes one round-trip to the airport. Line 1 - Piraeus – Kifissia, connects the port of Piraeus and the northern suburbs of Athens via the city centre. Be sure that you keep an eye on your personal stuff when using this line and be prepared for people getting in the train and asking for money. Note that line 1 is a rather old line (lines 2 & 3 are the new subway system of Athens). Line 2 - Attiko Metro]): Anthoupoli – Elliniko connects western and southern Athens. Line 3 - Aghia Marina – Doukissis Plakentias – International Airport connects the south-western suburbs with the northern suburbs (Halandri and Doukissis Plakentias stations) and the International Airport. The Suburban Railway is a new addition to Athens's public transportations network. The line starts at Piraeus, passes through the main line train station (Larissis) in Athens, and forks at Ano Liosia west to Corinth and Kiato and east towards the airport. Athens offers some of the best and worst urban walking in Europe. Several major streets have been recently pedestrianized, and a mostly car-free archeological walk which starts at Vasilisis Amalias Street, passes in front of the New Acropolis Museum, Acropolis, Herodion Theatre, Thiseio (Apostolou Pavlou Str), Ermou Street and ends at the popular area of Kerameikos (Gkazi) where numerous bars and clubs are located. Pleasant walking can also be had in Plaka, especially its upper reaches, and in much of Kolonaki, and the National Garden can provide a welcome respite from the heat and noise of the city center. On the other hand, Athens' horrendous traffic can make crossing the street in many areas a hair-raising proposition, and even walking down many major streets can be an unpleasant experience of noise and pollution. Cars and motorbikes parked blocking the sidewalks (illegal but ubiquitous) can also make a stroll difficult. Fortunately, much of the traffic-plagued area of the city can be avoided by judicious use of the new Metro, which goes most places a visitor would want to see or to walk around in. Kolonaki Square (Plateia Kolonaki; its official name is Plateia Filikis Etaireias, but no one ever uses it) is bordered with cafes whose customers tend to be drawn from the class of mature Athenian movers and shakers for whom the neighborhood is the traditional in-town home. Most of these cafes serve desserts and/or light meals as well as drinks, and most of them are expensive. They tend to be liveliest late at night. One of the best established, and most prestigious, is Lykovrisi. Not many foreigners show up in these cafes, but the visitor may find they make for interesting people-watching. Athens has a wide variety of accommodation options, from camping and hostels, right up to 5 star luxury hotels. Internet access is widely available throughout the country. Almost all hotels provide internet access, either free or paid. Local coffee shops usually offer free Wi-Fi access, as many other public places do. Feel free to ask for the password, if the network is locked. Internet cafes however tend to be expensive, about €1.5-2 per hour. The cheapest way to call someone abroad is to use a pre-paid calling card and call from a land line anywhere (also from your hotel room). Pre-paid calling cards are sold in many shops and kiosks. The calling card is not much more than a phone number and a pin code, which you dial prior to dialing the usual phone number. If you want to call internationally, ask for an international calling card. For one euro you can call for about 45 minutes, so buy a card in the cheapest value (which is about €3). Calling someone for half an hour is cheaper than sending one email from an internet café. Cards expire usually 90 days after first use. You can also use this pre-paid calling card at public phone boxes, which are widely available. Mobile phones are prevalent in Greek's communication, and if you need to talk with your co-travelers it is advised that you buy a local prepaid plan instead of using roaming, as it is far cheaper. There are at least three mobile carriers, Cosmote, Wind and Vodafone all of which require by law presenting some form of identification in order to activate your prepaid plan. Choose whichever has better reception in your area, keeping in mind that GSM 900, GSM 1800 and UMTS 2100 bands are supported. Data usage is cheap, costing about €3 per 100 MB. Ask the mobile carrier for more information. Hellenic Post is the Greek postal service. On their website you find more information about options to send letters, postcards and parcels and there is a search function regarding post offices and post boxes. It also has information on services like paying bills, transferring money, financial products etc. Greek post codes are five digits long and are usually written as follows; 123 45. The first three digits are used to identify the city, municipality or prefecture, for example the digits between 100 and 180 relate to the city of Athens. The last two digits identify a street or part of a street. Most post offices are open Monday to Friday from 07:30-14:00, although the largers ones usually have longer opening hours. For sending packages, you can also use international courier services like DHL, UPS or TNT. We have a comprehensive list of accommodation in Athens searchable right here on Travellerspoint. You can use our map to quickly compare budget, mid-range or top of the range accommodation in Athens and areas nearby. This is version 68. Last edited at 3:03 on Aug 2, 17 by sleepBot. 79 articles link to this page.